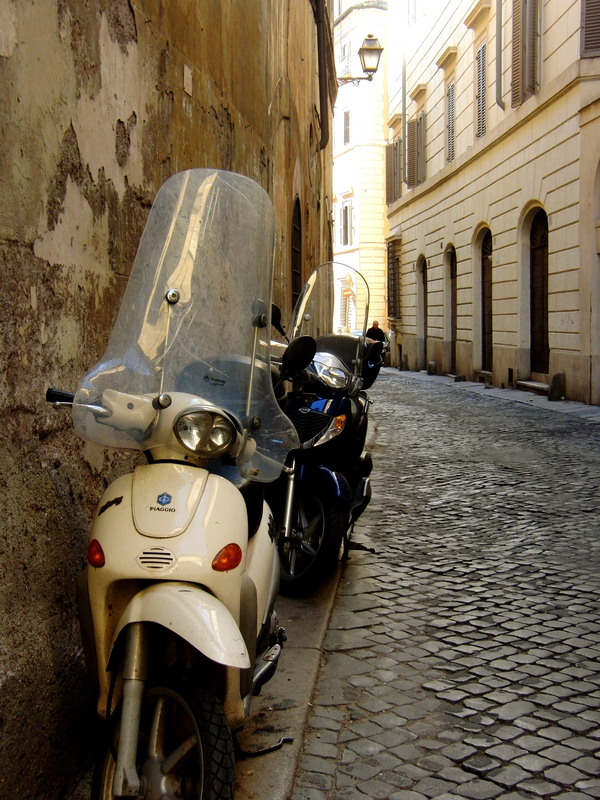 My first bowl of farro was in Rome, in an impossible to find cafe a few cobblestoned blocks behind Piazza Navona. I was living on ceci beans and eggs; the life of una povera studente. I sunk into a cushy velvet sofa next to chic architects in fedoras and trendy but trusty Roman sneakers, effortlessly beautiful women just done with yoga (quietly catching on in Rome), and other gli studenti, and as the chair swallowed me up, I devoured that bowl of warm farro mixed with Italy’s best tuna, shredded carrots, chopped vegetables, olive oil, and a few other goodies I can no longer recall. I cannot tell you how many times I tried to retrace my steps to this corner cafe. ‘It’s on a corner, across from a bodega….’ (as if that helps). And the few times that I managed to find it, I rewarded myself with a heaping bowl of this ancient grain. Choose whatever vegetables you fancy. 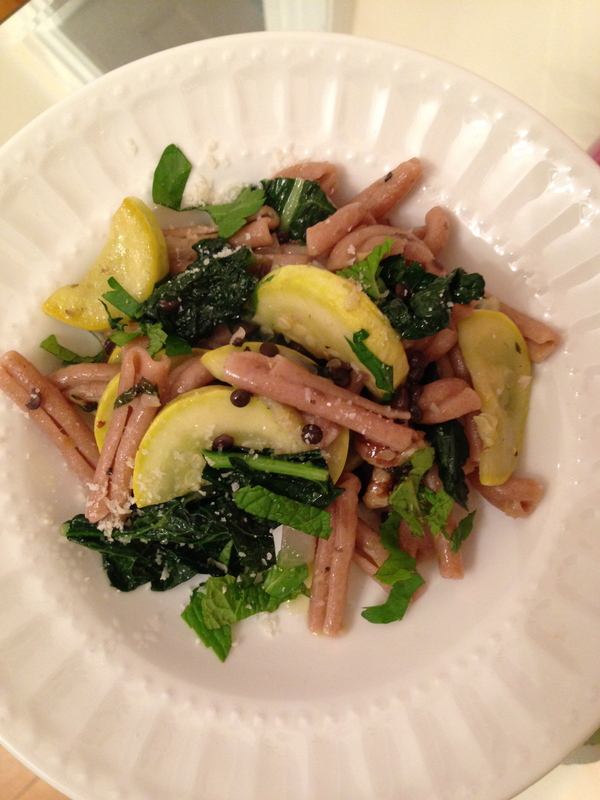 I really liked the addition of lemon zest and mint, and I tried to stay within a color story, hence the yellow squash and all of the greens. 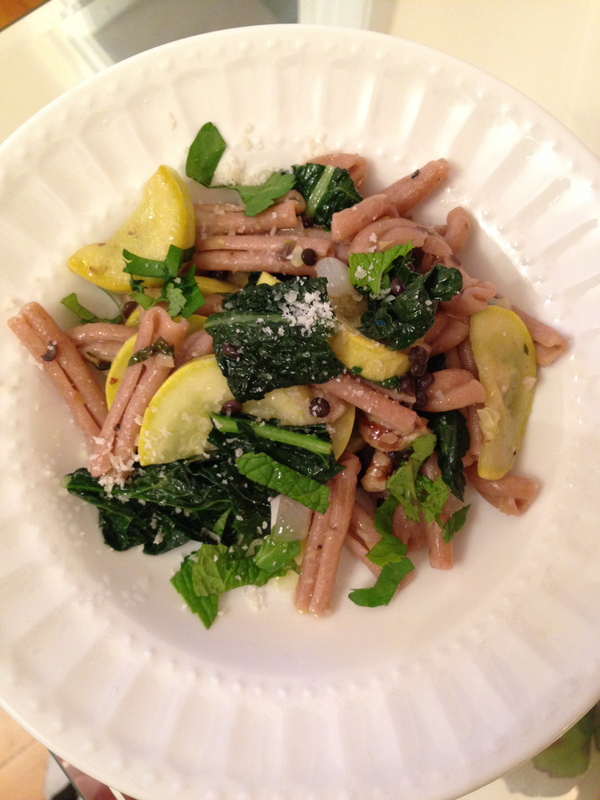 Farro is one of the healthiest wheat pastas you can find, as it is rich in folic acid. It is also very filling and intensely flavorful, so one small serving goes a long way. 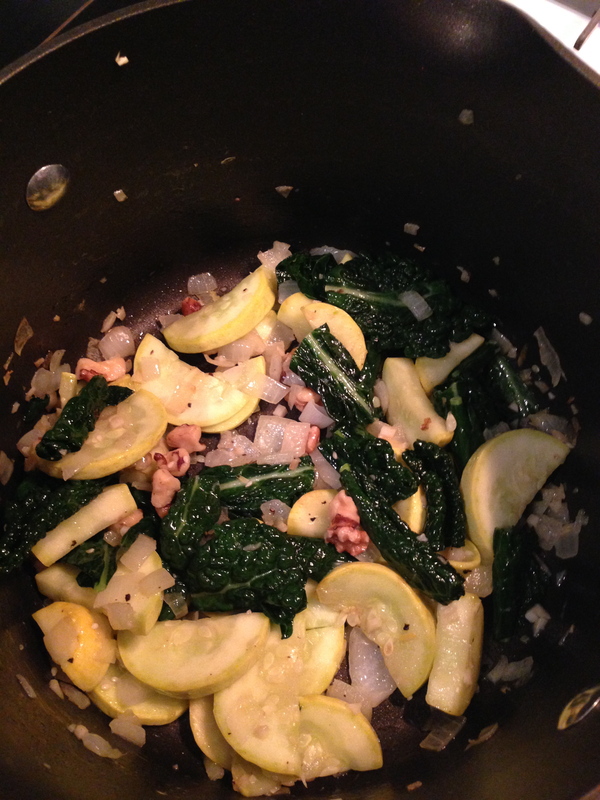 Ingredients (2 servings): 2 cups farro strozzapreti, 1 yellow squash, halved lengthwise then sliced into half-moons, 2 or 3 cups of roughly chopped lacinato kale, 1/2 yellow onion diced, 3 garlic cloves minced, zest from one quarter of a lemon, 1/4 cup chopped walnuts, fresh mint, fresh parsley, lots of cracked pepper, parmigiano reggiano, 1/4 cup beluga lentils, and the best extra virgin olive oil you can find. I cooked the pasta to just shy of al dente ahead of time, drained it, and set it aside loosely covered to stay somewhat warm. I saved about one cup of the pasta cooking water, knowing that I would need it to loosen up the pasta again when I added it back to the vegetables. Cooking time depends on how soft you want your vegetables. 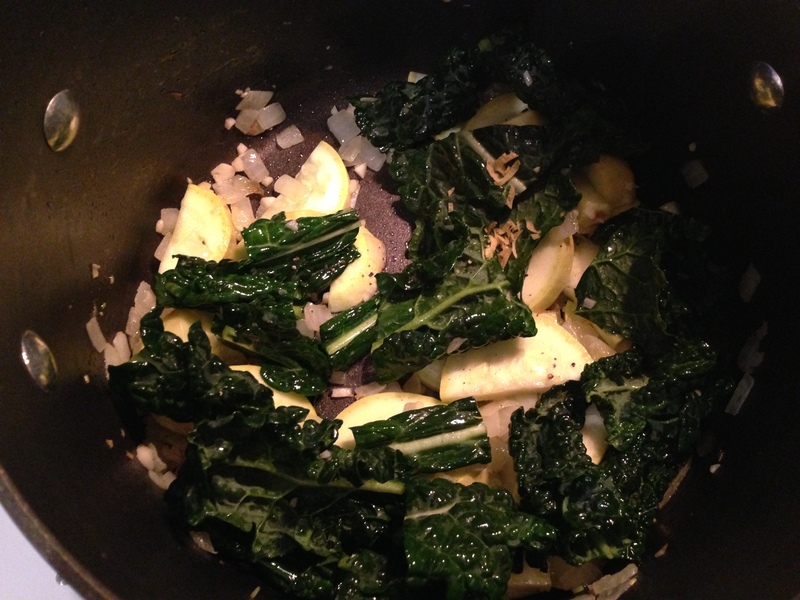 If you prefer the kale to be cooked closer to spinach texture, cook low and slow. I like to keep a bit of nutrients, so I cooked mine until tender. 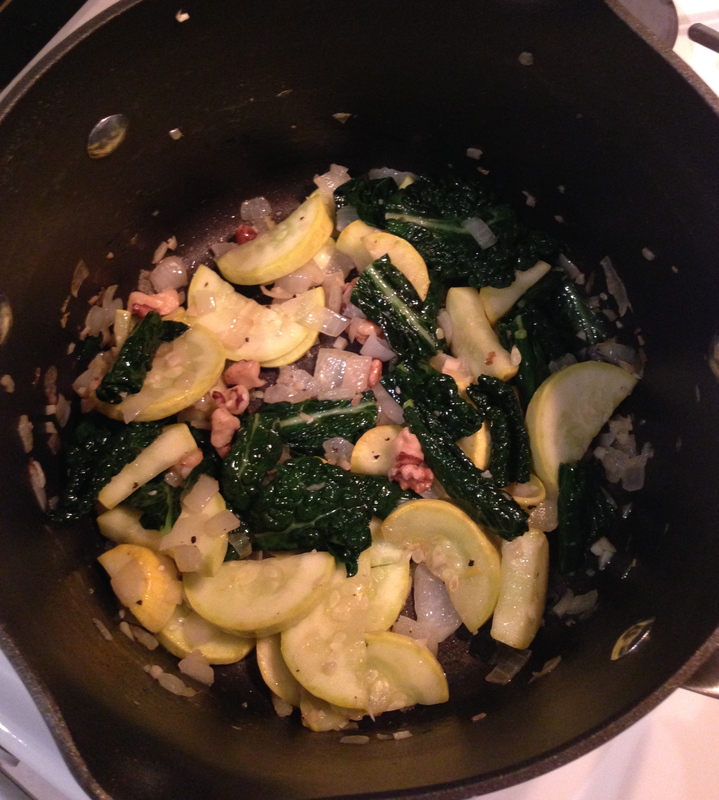 Add the walnuts and half of the lemon zest. About ready to add back the pasta. 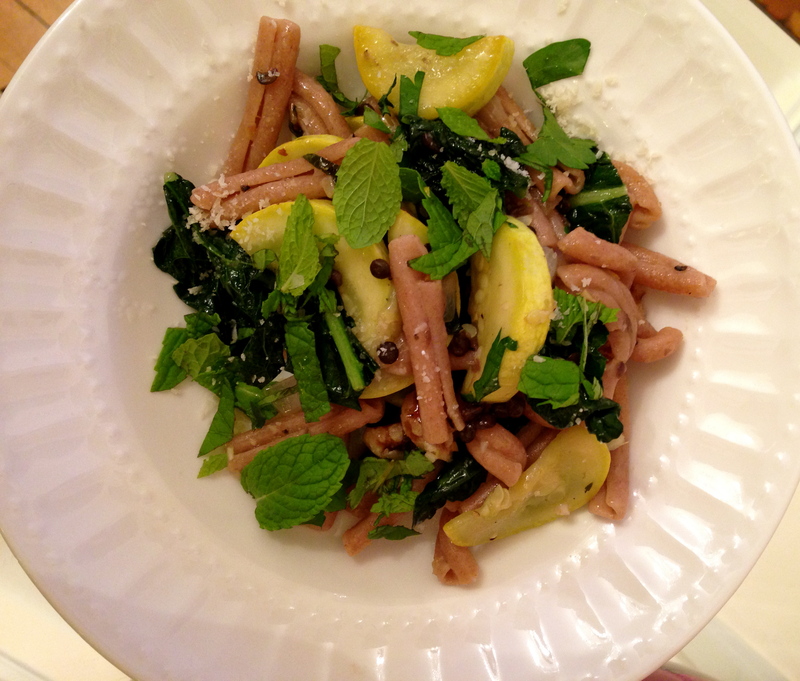 Combine the pasta and the vegetables. 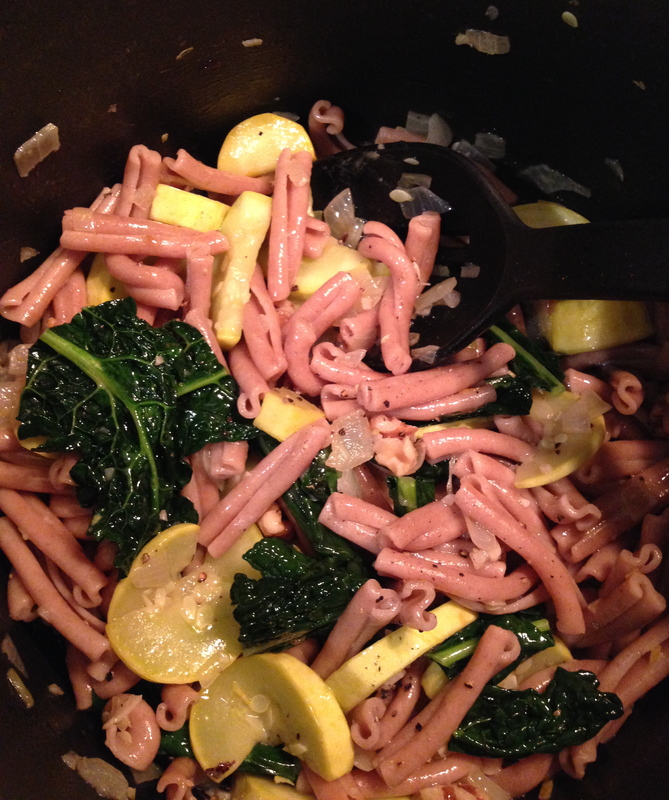 Add the pasta cooking water, extra virgin olive oil, lots of cracked pepper, and the rest of the lemon zest. Also add a little bit of grated parmigiano reggiano. I also added about 1/4 cup of beluga lentils at the end for added protein.